One of Virginia's remaining stone-arch bridges is joining Northern Virginia’s collection of protected parks. View of Goose Creek Bridge, among the oldest in the Commonwealth of Virginia, which was featured prominently during the Battle of Upperville. In June 21, 1863, the Upperville Battlefield laid witness to a significant cavalry and artillery fight across the historic Goose Creek Bridge (Courtesy Civil War Trust). 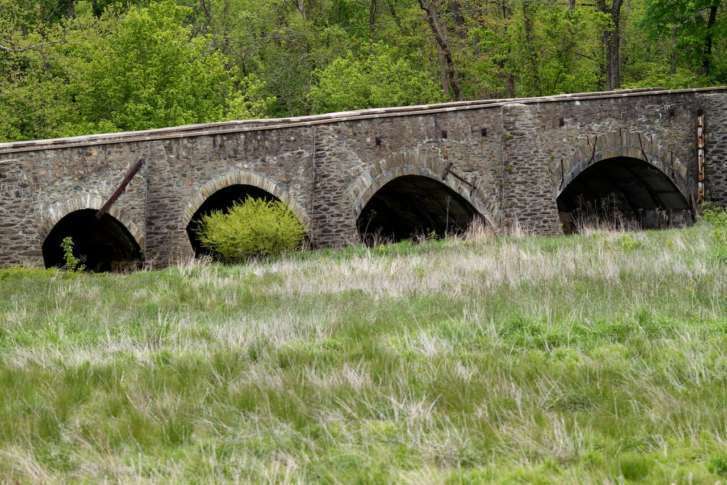 WASHINGTON — One of Virginia’s remaining stone-arch bridges, which also witnessed a prologue to the Battle of Gettysburg, is joining Northern Virginia’s collection of protected parks. Goose Creek Bridge was built around 1802 during Thomas Jefferson’s first presidential term. It had aged about 60 years when the Battle of Upperville broke out in June of 1863. Today, it’s one of four stone-arch bridges that remain in the Commonwealth, according to the Civil War Trust. At a ribbon-cutting ceremony to mark the preservation announcement, Gov. Terry McAuliffe noted that a big part of the state’s tourism income is because of visits to historic sites such as battlefields. “But it’s not only about the money, which is important to do the things we need to do, but it’s about our future,” McAuliffe said. “What you see here is a living classroom,” he added, while acknowledging students from Middleburg Montessori School who were on hand to help cut the ribbon. When history lovers and preservation allies assemble to preserve historic treasures, “we assure that these grounds will be there for our children, our children’s children and even their children,” said Phyllis J. Randall, chair of Loudoun County Board of Supervisors, who also attended the ribbon-cutting ceremony. “Going forward, the great stories about what happened here will be told,” Randall said. According to the Civil War Trust, former U.S. Senator John Warner donated 12 acres next to Goose Creek Bridge to the Fauquier and Loudoun Garden Club years ago, “which he knew, long before any of us, was important … These battlefields are filled with our American stories and must be shared,” said NOVA Parks board member Cate Wyatt. Fauquier and Loudoun Garden Club worked to preserve the bridge and looked after it for several decades. The Civil War Trust will turn over that land along with a neighboring VDOT parcel to NOVA Parks, the preservation group that is taking over public stewardship of the bridge and 20 acres around it.